Click on the image for the IDOE standards link. 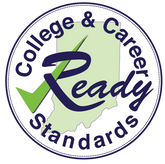 Heritage Intermediate teachers have worked very hard to ensure that we understand and implement the Indiana College and Career Readiness Standards. We have processed through the standards and developed I Can Statements from the state standards.. I Can Statements are statements that we use with students to help them understand what they are learning. Our ultimate goal is that the students will be able to make the I Can statements with confidence and then explain how they know that they can do the task. I Can Statements are attached to this page. you can access them through the drop down tab at the top of the page.